All canned goods must be in proper glass canning jars with 2 piece lid and ring, except maple syrup. Jars no larger than 1 quart / 1 litre size. Jellies and marmalade with proper seals and rings. Best Cranberry Preserves using the provided recipe. Winner to present sponsor, Bruce Brock, with unopened jar of preserves in order to receive prize money. Exchange to take place before Sunday closing. 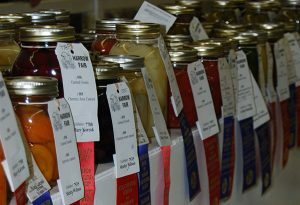 Winner to present sponsor with unopened jar of jam and recipe by Sept 30 in order to receive prize money. Winner to present sponsor, Tony Fisler, with unopened jar of preserves to receive prize money. Exchange to take place before Sunday closing. Clean and wash cranberries. Drain well. Add 3 cups sugar and water. Cover and refrigerate overnight. In the morning, place in saucepan and bring to a boil for 10 minutes. Remove from heat and add strawberry Jello. Stir until dissolved. Pour into sterilized jars. Refrigerate until ready to use.